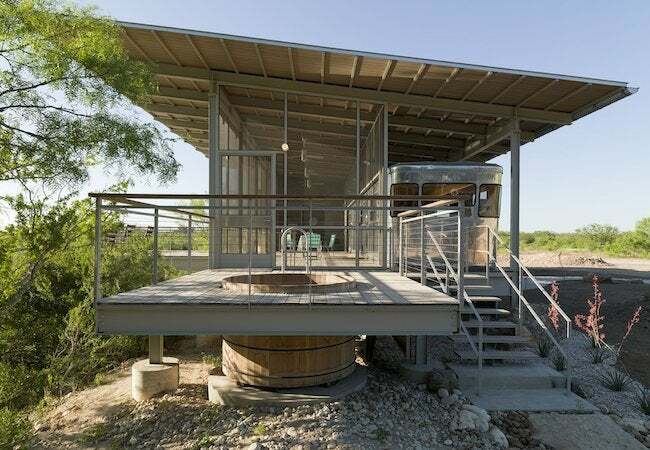 See how architect Andrew Hinman embedded a mid-century trailer at the middle of a new structure in Texas Hill Country. Flash floods are a reality in Texas, at least near the Nueces River, which runs through the 10,000-acre ranch owned by a global beauty products company founder. 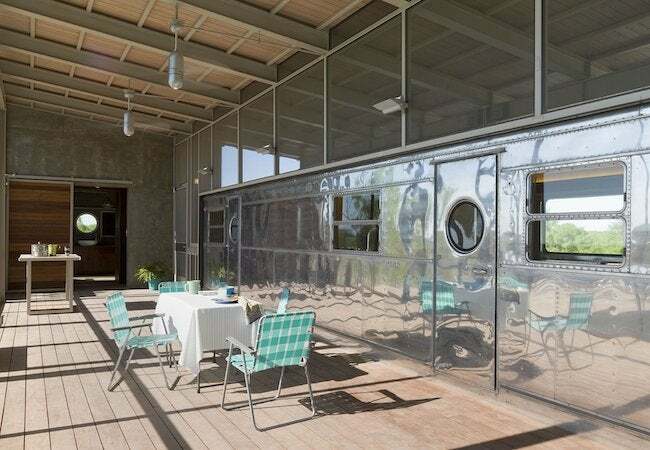 In 2012, he reached out to architect Andrew Hinman with a specific idea in mind: permanently situating a prized possession—his 1954 aluminum-clad house trailer—as close as possible to the family’s favorite spot on the river. The shelter would make the trailer more comfortable and functional as a launch pad for hunting, fishing, and swimming adventures. And of course, it needed to ensure that the trailer would not be swept away by the flood waters that return on a seasonal basis. Hinman says the trailer was the “the raison d’être for the entire project.” One part of the job was to restore the trailer itself, and Hinman did so by paneling the interior in bamboo, while updating many of its outdated fixtures and fittings. The other part of the job was more dramatic and involved surrounding the trailer in decking, a section of which would be screened, a section of which would be open. 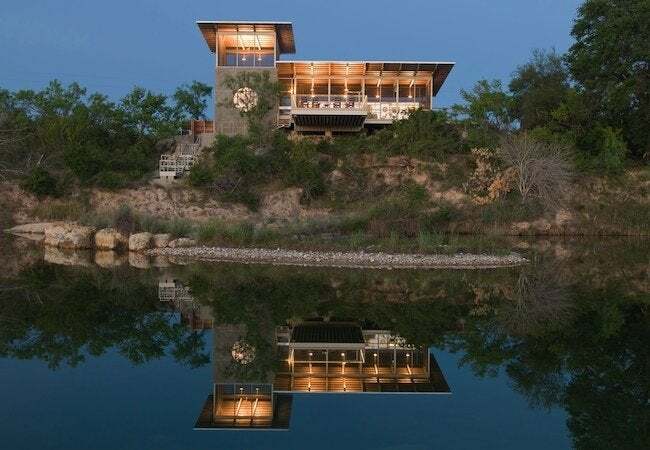 From here, the client would be able to enjoy panoramic views of Texas Hill Country. Hinman remembers that he initially “sketched up a big screen porch with a cradle to hold the trailer.” From there, the project took on complexity, particularly once the client’s wife had seen “the tiny little bathroom in the trailer.” It wouldn’t do. So Hinman designed a separate bath. 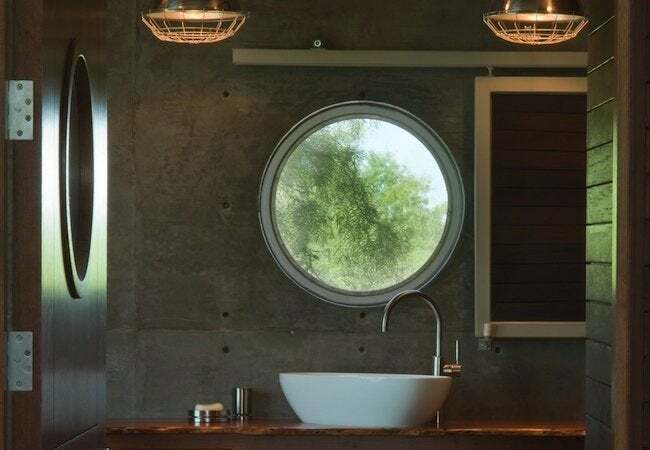 Air conditioned, with a footprint of 150 square feet, the bathroom includes a stone tub that was handmade in Italy and cost $18,000. All told, Hinman estimates the entire project came out around $1 million. The state of Texas figures largely in the story of the Locomotive Ranch Trailer Home. Hinman himself works out of Austin, and he called in a team of Austin-based artisans to make his design a reality. Among them was Mike Thevenet of Boothe General Contracting, who coordinated the work of electricians, carpenters, and welders (Paul’s Portable Welding is a family-owned business run by three generations of men, all named Paul). Even the trailer itself boasts Southwestern heritage, having been manufactured by the Spartan Aircraft Company. Though it’s now defunct, Spartan was born and operated for decades out of Tulsa, Oklahoma. Construction began with sinking a dozen concrete piers, each 18 inches in diameter, deep into sedimentary river rock. “It’s firmly rooted,” Hinman sums up. On top of the piers is a steel carriage, securely welded and bolted to the poured concrete building that now anchors the architecture, both visually and structurally. “It’s like a blockhouse,” Hinman says. “It’s blast-proof. The walls are 12 inches thick.” In design, the tower echoes the profile of rainwater-collection structures that were preexisting on the property. At the top of the tower is a screened-in sleeping porch; here, the occupants would be safe even from a flood of Biblical proportions. Thin and transparent, the new house appears to float above the river. That’s due in part to advances in technology. Instead of conventional screening material, Hinman chose innovative fiberglass mesh, which is impervious to the dings that would mar a metal screen, and which also lends the house a diaphanous look. “People look at it and think it’s made of glass… but it’s not glass at all,” he says. No. It’s more like a 1,200 square-foot screened porch, designed to shelter a 40-foot, mid-century modern trailer.